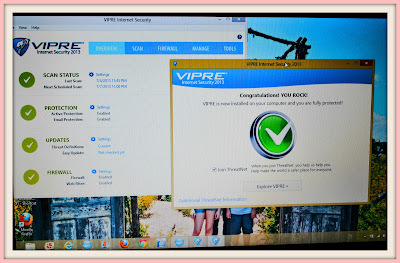 I recently downloaded VIPRE Internet Security 2013, an award-winning antivirus software that includes a firewall, a spam filter and bad website blocking into one powerful solution for complete protection against malware. As a blogger, who's always online surfing the internet, I wanted a strong PC security software to protect my computer from malicious internet traffic. VIPRE Internet Security is packed with sophisticated security features that protect against viruses and other malware threats without slowing down your PC. You won't notice it's running (even during scans and updates). VIPRE Internet Security the only antivirus solution to include automatic software patching with the Easy Update feature. Out of date software like Windows, Java, Adobe, Skype, iTunes and others are the most common cause of PC infections, and VIPRE is the only antivirus to automatically patch these security holes. NEW VIPRE® Easy Install™: Ensures a smooth, trouble-free installation process by eliminating any possible software conflicts. and easily with customizable settings for advanced users. Spam filter: Filters unwanted email from your inbox and safeguards against spam, phishing scams and malicious URLs. Bad website blocker: Blocks access to malicious websites to prevent you from inadvertently browsing to them and compromising your PC. High-performance anti-malware engine: Combines advanced antivirus and anti-spyware technologies to provide complete security that doesn't slow down your PC. All-in-one PC security: Detects and removes viruses, spyware, rootkits, bots, Trojans and all other types of malware. Real-time monitoring and protection: Leverages multiple detection methods to monitor and protect against web threats, including zero-day threats, in real time. Removable device scanning: Scans USB flash drives and other removable drives and files for threats automatically when plugged or inserted into your PC. Advanced anti-rootkit technology: Finds and disables hard-to-remove malware that gains unauthorized access to and hides deep within your PC. Email virus protection: Protects against email viruses in Outlook, Outlook Express, Windows Mail and any email program using POP3 and SMTP. Secure File Eraser: Adds an "Erase Files" option to your Window's Explorer menu to permanently delete all traces of a file. History Cleaner: Removes browsing and search histories, including the history stored by many popular applications.